A friend and I go on a two hour hike every week and I'm always rushing out of the house at 8:30 AM to meet her. I'm really not interested in whipping up a green drink before I leave, but I feel that I should eat something small before or during our hike. 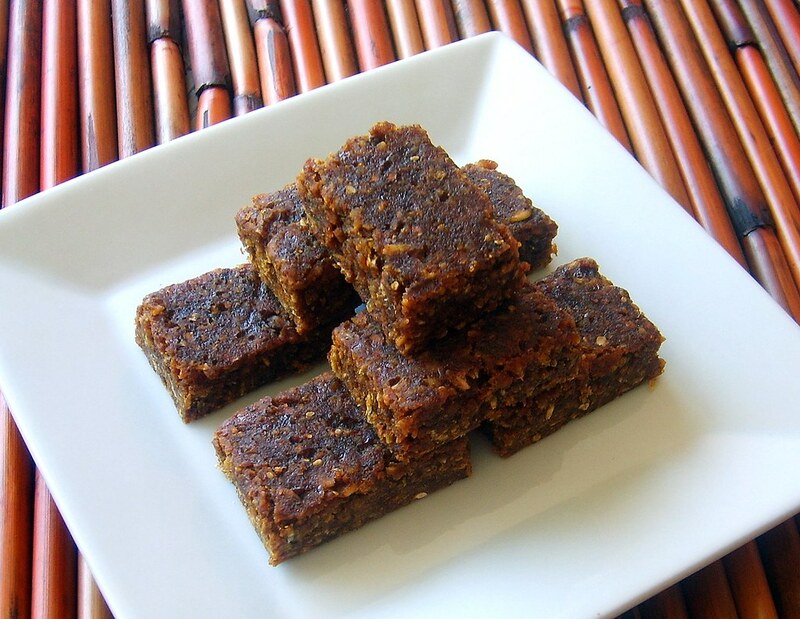 I started purchasing some vegan energy bars but some are really high in fat and sugar and so I thought that I would make my own. Now, I haven't calculated the sugar, carb or fat grams for these mini bars (wouldn't know where to begin), but they can't be all that bad. Most importantly they are homemade, delicious and provide me with enough of carbs and protein to fuel our morning hike. Kids will love them too--it's a great replacement for cookies! So Val, if you read this before we meet tomorrow morning--don't eat anything for breakfast because I'll be bringing along some of these healthy high-energy bars! If you have a dehydrator then you can easily serve these raw. I don't and so I slowly baked them at the lowest "warm" oven temperature which ranges about 135-145 degrees depending on the location in my oven. It took about 13-15 hours at this temp to get them to be the right consistency. Of course if you don't care about eating raw energy bars, then I would turn up the oven to 250 degrees and cook them in half the time. Since I don't have a dehydrator, I'm not certain how long they would take, but it would be fun experimenting though if I had one! In a medium size bowl, soak almonds, sunflower seeds, dates, apricots, goji berries and raisins for about 1 hour. Soak the rolled oats in separate bowl for the same time period. Drain nuts and fruit really well and grind in a food processor until you get a thick paste, scraping down the sides. Add ground flaxseed, agave syrup, cinnamon and sea salt and blend until combined. Remove paste from food processor and place in a medium size bowl. Drain rolled oats really well and add to paste along with dried coconut and stir well to combine. Line an 8x8" square baking pan with aluminum foil or parchment paper and with a spatula add mixture to the pan smoothing the surface to make sure that it is even and flat. Depending upon what temperature you use will determine when you flip the bar and cook on the other side. Again, I cooked the bar at my lowest oven temp for 6 hours. I then removed the pan from the oven, lifted out the bar, flipped it over onto a lined baking sheet and baked it for another 6 hours. I then cut the bar into individual 1"x2" squares and returned them to the oven for another 1-2 hours. When finished, let the bars cool to room temperature and then place them in a sealed container, separating layers with sheets of parchment paper.